12 Months Interest Free Financing!! Like with any home improvement project, cost is a significant factor. If you are thinking of installing a fence or hiring a professional to do it for you, it’s important first to understand the process of fence installation to ensure you make the best decision to meet your needs. According to HomeAdvisor, most homeowners spend anywhere between $1,645 and $3,946. The national average cost for installing a fence is roughly $2,737. Some homeowners can save approximately $1,000 off the average installation cost while the upper price boundary is around $4,000. Although cost if a significant factor for fence installation, it is also important to consider what type of fence you need to achieve your goals such as security or privacy. Permits. The average building permit costs roughly $800. Be sure to contact your local municipality to see if a permit is required for your project. Parts. A fence contractor can acquire parts for you and charge you for them later. Many time they receive discounts on parts, helping to make the project more cost-effective for you. Grading. Sloped land can make installation more difficult, which could cause costs to go up. Utilities. Call 811 to verify that your fence installation won’t interfere with any underground pipes or wires. Not checking for underground utilities could result in costly repairs down the road. Labor. Homeowners can expect to typically be charged per linear foot for materials and per hour for labor. Labor and materials will usually be charged together. Height. Six feet is a popular height for most fences. You can expect to pay about $7 to $19 per linear foot depending on the materials you choose. Decorative or ornamental add-ons will raise the cost. Chain-link is a very cost-effective option. Vinyl can be more expensive, but it is a long-lasting and low maintenance option compared to wood or chain-link fencing. 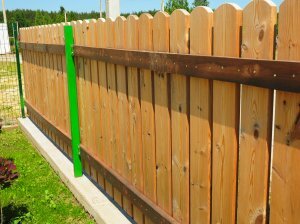 Wood fence installation costs can fluctuate depending on the type of wood being used. Aluminum or wrought iron are considered specialty materials and can carry a more expensive price tag. Before you begin your project, be sure you receive a solid estimate from your fence company. Pittsburgh fence contractors like Fence by Maintenance Service Inc. have friendly customer service representatives that are available to help you get started with your new fence installation. If you are looking for a residential fence contractor in Pittsburgh, trust Fence by Maintenance Service to provide you with a high-quality and durable fence to meet your needs. From vinyl and privacy fencing to ornamental and guide fences, we have the materials and expertise to help you design a fence that fits your needs for security, privacy, and increasing your home’s curb appeal. Copyright © 2017 Fence by Maintenance Service. All Rights Reserved.